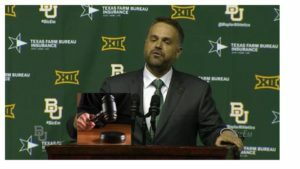 Matt Rhule made a couple of big moves this past weekend when he filled out his offensive staff by hiring Matt Lubick (Co-OC/WR coach for Oregon) and Jeff Nixon (TE coach for San Francisco 49er’s) to be the co-offensive coordinators in Waco. The rest of the staff includes Texas HS fave Joey McGuire from Cedar Hill HS and the Temple OL coach. He also signed a QB to join Baylor’s nearly empty but rapidly growing 2017 recruiting class in Lake Travis signal-caller Charlie Brewer. The Bears will probably sign multiple QBs in this class, since all they have left over from the Briles’ era is sophomore-to-be Zach Smith. With those additions we now know a good deal about Rhule’s offensive strategy for competing in the Big 12 and, just as importantly, who exactly will be in charge of implementing it. It’s clear enough from Rhule hiring local Texas guys to fill out his staff and then grabbing coordinator staff from the Chip Kelly/Oregon coaching tree that he intends to run Oregon-style spread-option football. I broke down the four main schools of spread offense awhile ago at Football Study Hall. I don’t know if I would make the same distinctions about the four main schools or not but it’s a useful starting point and you can read about the “spread-option” style on that link. The signatures of this scheme are usually outside zone blocking, a priority on recruiting speed at the skill positions, and a quick-triggered (ideally mobile) QB. Oregon always got credit as a smashmouth team because they were run-centric and loved to spread you wide only to create creases to run the ball in, but they were never a smashmouth team in the sense that I’ve preferred to use it for “smashmouth spread” teams that are designed to create multiple stress points with a two-back run game. This style is actually similar in many ways to what Washington or K-State utilize, a run-centric approach to offense but one that isn’t trying to be the biggest, toughest team in the trenches. That’s actually a pretty considerable departure from the Art Briles system, which at its heart was a brilliant way to allow a program that lacked access to the biggest, most athletic OL to still run power down your throat and use play-action to throw it over your head. Baylor will now stop focusing as much on creating vertical stress and instead apply horizontal stress. That potentially makes for more of a ball-control style although that’s not at all how Oregon has utilized it in the past. They’d create horizontal stress but they’d mix in blazing fast skill players and operate at very fast tempo so that you were always at risk of breaking due to a missed tackle on the perimeter or an assignment bust. Rule’s first QB signing hails from Lake Travis, who just had a very impressive season in which they went 15-1, won the highest level Texas state championship, scored at least 50 points in 11 out of 16 games, and won every playoff game by at least 19 points with an average margin of +39. Lake Travis is a school from the wealthy west side of Austin, TX on the near side of Lake Travis. Chad Morris really put them on the map with back to back titles in 2008 and 2009 with Garrett Gilbert but they won three more after he left, the last one with a guy named Baker Mayfield. This year is the first title they’ve won since moving up to the highest level. As listed on the highlights, Brewer put up some huge numbers this year while being named 6A player of the year. He had a 78% completion rate while throwing for 3923 passing yards, going 56-3 on TD/INT, running for 750 yards…they were lighting people up. He’s much more advanced as a passer than your typical QB fresh out of high school, you can chalk that up partly to playing in such an amazing program, partly to having a ton of amazing targets, and partly to operating in mostly clean pockets. He’s got a strong enough arm and throws well on the move but his greatest attribute is his ball placement and accuracy, particularly throwing fades or hitting guys on the run over the middle. He’s about the same size as Baker was out of high school and can probably get a little bigger to end up somewhere in the 6-0, 210 range that Mayfield is at currently. I haven’t found results from him undergoing the Sparq testing but from film I’m fairly confident putting him at 4.8 in the 40, maybe even a little quicker, and 4.4 or better in the shuttle. He’s certainly quick enough to do some QB-read runs and he has confidence and experience running them from his time at Lake Travis. Like Mayfield, he’s the kind of guy that can do enough things well to make it really easy to unlock the skill talent around him even if he’s not elite or dominant in any particular facet, although he might be in the spread passing game thanks to his accuracy. 247 had him listed as a 3-star “pro-style QB,” which is indicative of service ranking failures when it comes to evaluating and labelling QBs, and he was committed to Chad Morris at SMU until Rhule swooped in. By “pro-style” QB I assume they mean what I call a “pocket QB” meaning someone who’s at his best operating from the pocket. Brewer is comfortable moving outside the pocket, indeed he needs to be in order to operate a spread or to play effectively at 6-0, and is best viewed from the lens of “what can he handle in a spread concept?” He can handle a lot and he can definitely handle the Oregon-style spread-option system that’s high on quick distribution and some QB-read runs. I assume Baylor will mix in a great deal of passing game given that their roster is stocked with big time WRs and both Brewer and returning starter Zach Smith are guys that will be at their best throwing bubble routes and RPOs off zone action rather than getting featured on zone or power-read. Not that I don’t think Baylor will utilize those concepts, but drop back passing, play-action, and RPOs will likely be the bigger component. As for the rest of the roster, the biggest question will be how Baylor’s OL adjusts to the new scheme and how well they can re-stock it. With this style of offense the new priority will be on athletic guys that can move, even smaller ones (you don’t have to be huge to run outside zone, just watch Terrale Johnson and K-State), so that they can keep in front of people to create creases with their horizontal stretch concepts. My biggest question is whether Matt Rhule will embrace up-tempo offense of the sort that Oregon has always utilized, particularly the up-tempo practice format which has been the graveyard for many a defense. The challenge with that format is that it limits live tackling and makes it hard for a defense to learn how to pursue the ball with leverage and tackle as a team, it’s also a challenge for coaches who are used to giving on the field instructions. However, Nixon has been working in the NFL where tempo is limited and controlled by the officiating so perhaps they’re planning on reigning it in a bit. This will be something to watch. That’ll be a big deal in terms of in-game strategy as well. Defensive coaches like Rhule didn’t put up big numbers by allowing their defense to see the field for 80+ snaps where offenses can pinpoint their disguises and game plan and get after them while wearing down their DL. Is he planning on installing the spread-option to use it for ball-control to protect his defense or will he allow them to go ultra-fast? If his coaches know how to do the former properly then I think that’s what you can probably expect. Finally there’s the question of how quickly this will take with a Baylor offensive roster that is limited in terms of numbers and includes a lot of talent that hasn’t been executing the same routes, protections, or schemes despite the overlapping “spread-option” idea. This isn’t like going from Briles’ offense to an I-formation pro-style scheme but if commenters are telling you that it’s basically the same system don’t believe them. It’s not. When Matt Rhule was hired my biggest question was what he would do on offense after he put some really plodding and ineffective units on the field at Temple and how he would recruit Texas after spending years recruiting the Northwest. The answers we’ve seen so far is that he has surrounded himself with some of the top people in the state and hired coordinators from an overlapping school of offense to install something that could potentially give him a run-centric, ball-control style opposite his trademark defense. There are still some questions to be answered, but every new answer suggests that the #RhuleofLaw is really going to take hold in Waco. Thank you for breaking this down. Will be interested to see what happens! If they are going to run an outside zone-centric offense, then I’m pretty pessimistic about the Bears running game in year 1. I love me some outside zone – it is my favorite run play – but it is a tough system to develop in a short time span. You have to take guys who are used to just straight up mauling people to instead use their speed, athleticism, and technique to take defenders out of the play. And that takes time. The advantage is that you are never going to get stopped simply because the opposing front-7 is bigger and stronger than you. But the downside is that it takes a lot of time to get all of the offensive linemen to work together well enough to execute this scheme. It is literally one of those concepts where it is better that everyone is wrong together than 4 out of the 5 are right. I like the fit with Rhule’s defense, but bearish on early rushing success at Baylor. Yes, great points. This is why it’s a favorite concept in Manhattan. They can run more inside zone in year one, or pin and pull, or stick with power as a main staple if they like while they make the gradual transition towards outside zone if that is indeed their destination point. We’ll see how it goes, they’re looking at a lot of initial changes in adapting the new strategies on both sides of the ball. Could make them vulnerable to losing ground (temporarily at least) to Iowa State.